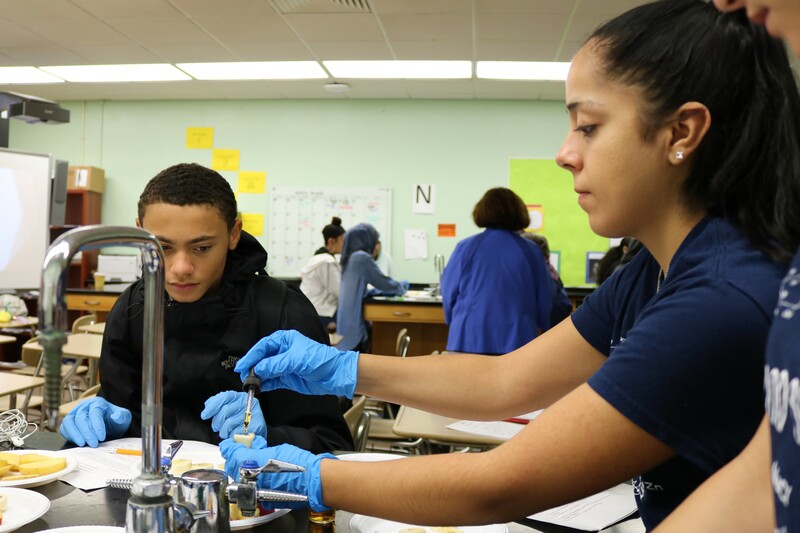 Food Busters engages Henninger High School (HHS) students in hands-on STEM focused lessons that explore the relationships between food, nutrition, health and media to increase students’ literacy, mathematics and science comprehension. David B. Falk College of Sport and Human Dynamics nutrition students work in groups and build relationships with HHS students to explore and perform food science experiments. The idea for the creation of Food Busters stemmed from a response from Mary Ann Shaw Center for Public and Community Service (Shaw Center) interns to the Clinton Global Initiative’s challenge of improving literacy skills and public health awareness. Shaw Center Nutrition Volunteer Coordinators Jenifer La ’14 and Katelyn Castro ’15, and Engagement Fellow Victoria Seager G’15, collaborated to develop the idea in 2014, following the established program model for Books and Cooks! At the 2014 Clinton Global Initiative University Conference, Food Busters was recognized as a “Commitment to Action.” After the conference, program coordinators Victoria and Katelyn brought back their new ideas and inspiration to begin planning the program. In fall 2014, the coordinators formed a partnership between the Shaw Center, a science and a culinary teacher at the Institute of Technology at Syracuse Central (ITC), and Falk College faculty. Coordinators worked with the teachers at ITC to develop STEM and nutrition focused lessons that aligned with Common Core, New York State and Next Generation curriculum standards. Faculty in Falk College advised on nutrition concepts and the development of lab ideas. In spring 2016, the coordinators expanded the program by developing a new partnership with Melanie Pelcher, a physics and science teacher at Henninger High School. The program was adapted to align with the ninth grade Principles of Biomedical Sciences course’s Project Lead the Way national curriculum, while also meeting Common Core, New York State, and Next Generation curriculum standards. Project Lead the Way is a nonprofit organization that creates STEM focused curricula that emphasize real world challenges and applications. Their Principles of Biomedical Sciences course exposes students to forensics and health-related topics through lessons focused on the life and death of a fictitious woman, Anna Garcia. Students learn about various health problems and topics through the example of Ms. Garcia. In fall 2016, due to staff changes at ITC, Food Busters worked solely with HHS. Also beginning in the fall of 2016, Dr. Margaret Voss began working with Food Busters ad the faculty advisor for the program. 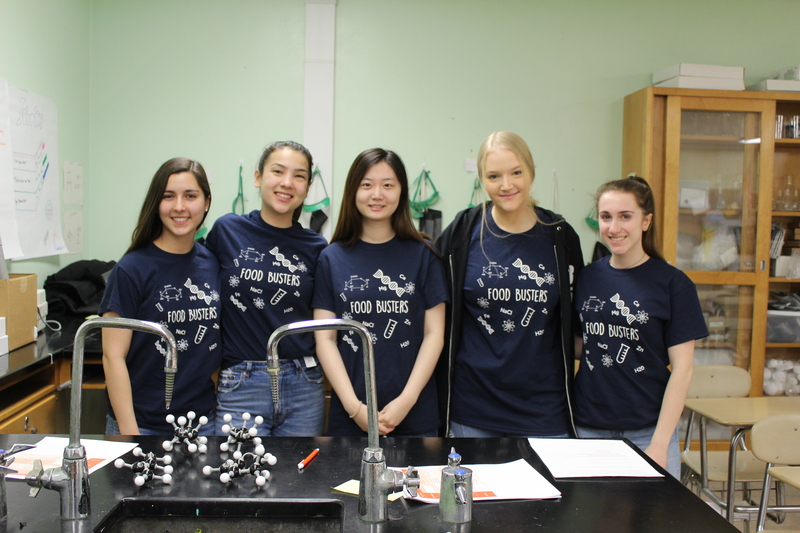 Using her expertise in biochemistry and metabolism, Food Busters has increased in complexity while still bringing the real life application to high school students. 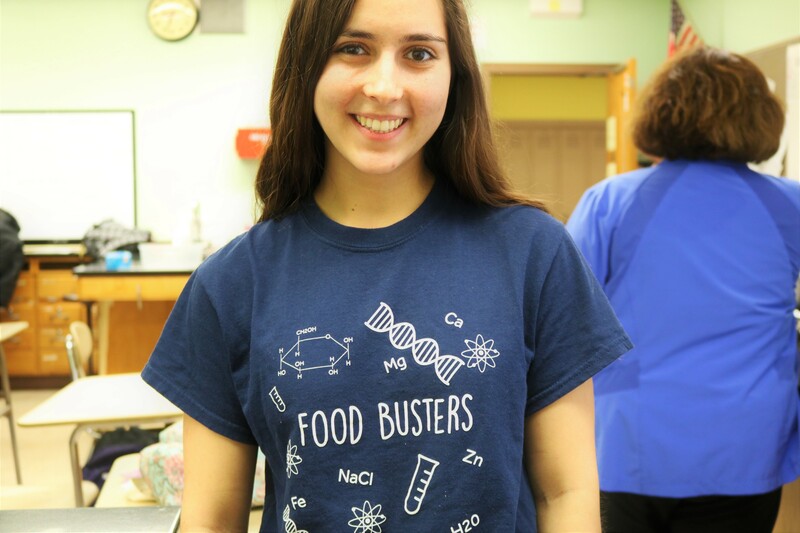 Throughout fall 2017 and 2018, Food Busters continued working with Dr. Voss and Henninger High School through Melanie Pelcher. Each Food Busters lesson consists of three components and the focus of the lesson correlates with the unit the class is currently working on. Students begin on Thursday with a pre-lab activity. Since they have access to a laptop computer for each student, the program coordinators create an interactive and engaging PowerPoint that students can view individually while also completing a pre-lab packet. If there is lab preparation for Friday, the pre-lab includes setup instructions for the students to complete with guidance from the teacher. On Friday, students split into four small groups and rotate between four stations as designed by the program coordinators. Stations focus on the week’s lab, concepts that align with the current unit, as well as the students’ food choices and the role nutrition plays in the body.